[April 23, 2019] SAN JOSE - Paul Anthony Craft, 58, of San Jose, passed away March 31, 2019 at Pekin Hospital. Paul Anthony Craft, 58, of San Jose, passed away March 31, 2019 at Pekin Hospital. 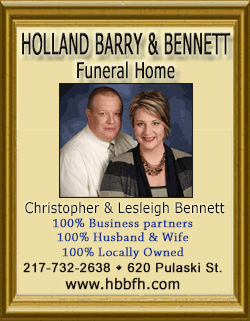 Cremation rites were accorded by Holland Barry & Bennett Funeral Home, Lincoln. Paul was an organ and tissue donor through the Gift of Hope Program. A celebration of life will be held Saturday, April 13, from 12-2 at San Jose Christian Church. Paul was born July 24, 1960 in Marion , IL., the son of Max and Jane (Newlin) Craft. He proudly served his country in the United States Army. He was a member of the American Legion Post 496. He was a mechanic by trade. Surviving are his mother, children: Crystal Craft and Anthony Craft; and sister Susan Stokes. He was preceded in death by his father and his brother, Sam Craft. Memorial donations may be made to San Jose Bank in care of Paul Craft.